Spanish painter, engraver and writer. He was a son of the Flemish painter Daniel Martnez (d. 1636), with whom he first trained, following late Mannerist trends. In 1623 he went to Italy, and in 1625 he was in Rome, where he met Guido Reni, Domenichino and, shortly afterwards in Naples, Jusepe de Ribera. This contact with Italian classicism and naturalism influenced his work, and he always maintained a preference for classical balance and structure. He combined this with chromatic tones and a chiaroscuro that became progressively softer. The extensive documentation on Martnez deals only intermittently with his paintings, and it is not always possible to trace his stylistic development. His earliest recorded work is the series of five engravings on the Life of St Pedro Nolasco (c. 1625), which were engraved in Rome by Johann Friedrich Greuter (d. 1662) after Martnez s drawings (untraced). In 1627 he returned to Saragossa and in 1632, together with Juan Galvn (d. 1658), he was nominated by the Diputacin de Aragn to examine the copies of portraits of the kings of Aragon made for Philip IV. Also about 1632 he entered the circle of the collector Vincencio Juan de Lastanosa, to whom he sent some engravings, perhaps the series on the Life of St Pedro Nolasco. In 1634 Martnez travelled to Madrid, where he came into contact with Eugenio Cajs, Francisco Pacheco and Alonso Cano. Treating the same subject as in his earlier engraving series, in 1635-40 he painted St Pedro Nolasco (Saragossa, Museo Provincial de Bellas Artes), though the dating is uncertain. His relationship with the Court was renewed when Philip IV visited Catalonia and stayed in Saragossa in 1642, accompanied by Diego Velzquez. Martnez was nominated Pintor del Rey ad honorem in 1643 and entrusted with the artistic education of Don Juan Jos de Austria. Velzquez became friendly with Martnez and occasionally used his workshop. 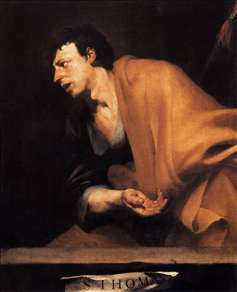 See more details about "Apostle St Thomas"